The early modern period is arguably the most pivotal of all in the study of the mind, teeming with a variety of conceptions of mind. Some of these posed serious questions for assumptions about the nature of the mind, many of which still depended on notions of the soul and God. It is an era that witnessed the emergence of theories and arguments that continue to animate the study of philosophy of mind, such as dualism, vitalism, materialism, and idealism. Essential reading for students and researchers in philosophy of mind, enlightenment philosophy, and the history of philosophy, Philosophy of Mind in the Early Modern and Modern Ages is also a valuable resource for those in related disciplines such as religion, history of psychology, and history of science. Rebecca Copenhaver is Professor of Philosophy at Lewis and Clark College, USA. Her work has appeared in the Canadian Journal of Philosophy, Res Philosophica, Philosophical Quarterly, Pacific Philosophical Quarterly, History of Philosophy Quarterly, Journal for the History of Philosophy, British Journal for the History of Philosophy and The Oxford Handbook of British Philosophy in the Eighteenth Century. 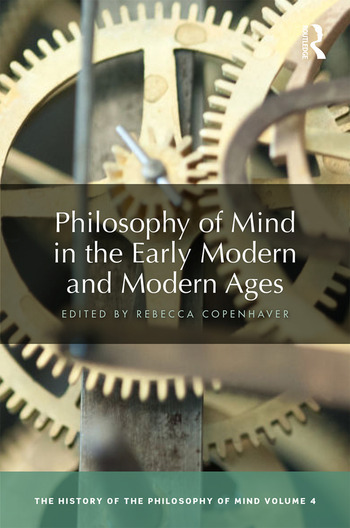 Copenhaver is the editor of the Seventeenth- and Eighteenth-century Philosophy section of the Routledge Encyclopedia of Philosophy.